We have a great selection of Designer Radiators for you to view. There are some superb designs here with a variety of different materials, from Stainless Steel, to Aluminium and Mild Steel. You can make the Radiator the focal point in your room. The different designs are so versatile, you can put them in your living room, hallway, kitchen, bedroom, dining room, conservatory, office or even a cloakroom. All the Designer Radiators at Great Rads are available for free UK delivery. Here at Great Rads, we pride ourselves on showcasing the most innovative heating technologies available on the market today. Making sure that we keep tabs on the next big thing in home heating is what keeps us at the height of the radiator game. Whether you’re looking for unique radiator finishes or a quick to heat dual fuel beauty, we always strive for the best here at Great Rads. That’s what keeps us up there as one of the top designer radiator sellers in the country, bringing warmth and comfort to homes across the nation. We strive to utilise our in-depth research and heating know how to bring you the best heating options from across the international market. One of our top focuses at Great Rads is on the designer radiator market. With so many radiators out there, many people are opting find something a little more unique. Whatever form that originality takes, it gives radiator customers a chance to express themselves through their heating unit, harnessing more personal control over the interior of their home. Whether it’s a radiator to suit the colour palette of your home, or a stylistic choice to complement the atmosphere, there are plenty of UK designer radiators for you to choose from. Whatever your price range is, there’ll be a designer radiator to suit your needs, both heating-wise and stylistically, giving you countless brands and quirks to find your perfect model. What constitutes a designer radiator then? What is the special something that sets apart the boutique and unique from the everyday? With a wide range of choices for your unique radiator, the designer is anything which is personalised and unique in some way. Often, a radiator seller will give you a range of options to personalise your radiator, whether that be through it’s finish, its material, its colour or it’s heat source. Radiator finishes give you the chance to explore a wide range of textures and colours for your radiator. Whether you go for sleek chrome finishes or a rugged cast iron embellishment, the radiator finish brings character to your radiator whilst improving its efficiency. Radiators are made from a wide range of materials, many of which not only improve the efficiency of your unit but add a dash of originality too. With flexible aluminium and sturdy iron being two of many options, picking your designer radiator material is harder than you would first think. Radiators are one of the most essential hidden features in any home or workplace, stabilising the temperature in the colder Winter months and making the home a more comfortable and enjoyable place to spend time. Whilst it’s important to keep your home warm most of us are also incredibly house proud in terms of interior design. Your home is your sanctuary, a place to spend time relaxing, with family and friends, and we ideally want our homes to look as beautiful as possible. Nowadays, radiators do not have to simply be a practical item, but they can also add to your interior design. The radiators provided here at Great Rads are not only practical, but also beautiful. Long gone are the days when your radiators have to be an irritating eyesore on the walls of your house; they can now be an additional decorative feature, complimenting the rest of your interior and adding decorative style. More and more home owners are heading to specialist showrooms across the country to ensure every part of their home is designed to perfection. With designer ranges becoming more and more popular, you too can make your home look as sleek and stylish as possible. Modern trends show that it’s not enough to simply install a heating system that keeps you warm. Nowadays, homeowners are looking for more; radiators that give the right look to their home instead of the more traditional, unsightly radiators used in the past. Here at Great Rads, we suggest that you look into the heat output along with the design while selecting a radiator so that it fulfils all your needs, both practically and aesthetically. We offer a perfect combination of utility and attractive designs. There are ample options available to choose from, and for this reason more and more home owners are opting for designer radiators to complete the look of their modern homes. With radiators designed specifically for each room including the living room, bedroom, hallway, kitchen, conservatory, cloakroom and offices, you’ll be sure to find something to fit your needs at Great Rads. Most home owners want their radiators to look great whilst also doing their job of heating the house very efficiently. At Great Rads, we have many different options available so that you can find something to suit your interior design. However, with so many options available, it can be difficult to choose between them. The amount of heat required is based on various factors of your particular room. This includes the size of the room, whether you have an open fireplace, and the level of insulation, for example if you have double glazing windows in the room. Additionally your choice of home décor can play a key role in the amount of heat needed, for example, French doors can have a significant impact on ambient temperature. You can make use of a heat output calculator which can help you to know the heat requirement for your room accurately. One can determine the temperature with the help of a British Thermal Unit (BTU) calculator. Apart from this, capability of your radiator also has an impact on the warmth you acquire in the room. An old and insufficient radiator is possibly incapable to suffice for your needs. The look of your radiators is annoyer considerable factor to think about when choosing. You may have a specific home décor and thus need to search for attractive radiators which can match up to your style quotient. In case you face such a situation, you can contact a specialist radiator company like Great Rads who have all the expertise you need regarding radiators. With our expertise, we can guide you well to select an impeccable radiator. We also offer regular sales which will save you from spending exorbitantly high amounts on radiators. We have a wide range of radiators which provide you with fashionable cuts and a great look for your home. The main unique selling proposition of a designer radiator is the combination of spectacular design with uniform warmth distribution across the room. Great Rads has a wide array of radiators for you to choose from in terms of designs, material, colour, brand and size, so you can really get something which goes perfectly with the rest of your interior design. These radiators are more often connected to public buildings, churches because they come in columns and sections. 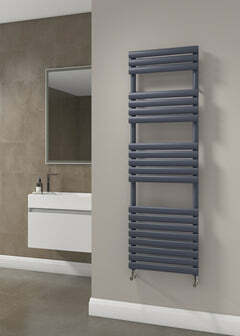 Towel radiators are perfect to be installed in bathrooms and kitchens. They add style to your bathroom and kitchen, whilst also providing a convenient storage place. Most radiators have a standard central heating system connected to anelectric, gas or oil boiler. This boiler heats the water and circulates heat across the home. As the name suggests, this is a closed system wherein the water is sealed in the heating system. This water cannot be replaced and continually circulates throughout the room. This system is connected to the main source of water like a borehole and changing the water is almost impossible. Therefore, radiators with open circuit heating system made from stainless steel and aluminium are a popular choice for consumers. A wide range of electric radiators are also available, especially in conservatories. Apart from these major elements, one should also look into the amount of wall space that you have in your room. Great Rads offers you alternative radiator options that can easily fit in your room. Budget is yet another important aspect that you should consider. Here at Great Rads, we understand your constraints and recommend an impeccable solution that fits within your budget. Once you have selected an appropriate radiator from a reputed designer radiator company, it is imperative to search for the correct place to install it. Installing it in the wrong place will hamper its efficiency and you are likely to receive less amount of warmth, not to mention it might not go well with your furniture arrangement. There are specific spots wherein you probably should install radiators in order to get the desired warmth. It is often preferable to install radiators underneath windows. However, from our experience, we would suggest that it is not the best place. This is because all the heat tends to gather on the top at the ceiling and you are less likely to receive the required heat. It is instead advisable to take recommendations from professionals at Great Rads, who can suggest an apt location to install your radiator. One option is to double glaze your glass windows so that you don’t have to deal with a scenario of condensation. Double glazing also restricts outside cold air from entering the room and provides more space for warm air around the corner. From our recent analysis, we can assure you that there is a huge demand for designer products in the market. We have proposed striking designs to client’s requirements and they have provided us with positive feedback on it. Our range comprises amazing designs which have remarkable attributes. Most of our clients prefer limited edition models radiators provided by us, to add that unique, individual and bespoke feel to your interior design. Apart from a variety in materials, Great Rads offers you the leverage to select the size and colour you would prefer for your radiator. As a designer radiator company, we offer versatile shades like brushed globes, lime green, dark grey, silver, etc, which are apt for your flawless home décor. Imagine having a magnificent view of your favourite luxurious sports car at the parking spot of your home. You could quite probably just stare at all day, couldn’t you? Likewise, you will favour installing a radiator which comprises qualities of being elegant, classy and possess the latest functions. At Great Rads, we offer the best deals of this kind to our customers as well as existing clients. For our clients’ convenience, we offer designer radiator sale wherein our clients can easily search for the best quality option based on their priorities. Style and preferences differ from client to client. Some favour stainless-steel models while others prefer aluminium radiators, but we provide something for everyone. At Great Rads, we offer more than just radiators, we offer something for everyone, whatever you aim to achieve in your home. With such as diverse choices of radiators in high quality, Great Rads can give you exactly what you are looking for. We offer a selected series of radiators which have energy saving elements. If you reside in an area where you have to use radiators for a long duration then it is advisable to purchase a radiator which comprises of this attribute. You will save yourself from digging a hole in your pocket and not have to pay huge energy bills, whilst also helping with the environment. With technology constantly evolving, it is essential that we use our knowledge to reduce adverse effects on nature. Humans follow a life cycle, and harming even a single aspect has a large consequential impact on the world around us. Therefore, make particular efforts to select radiators which are nature friendly, avoid using it excessively. Mirrors give an artistic look to your home, and can be installed in any room of your house to give an elegant look to it. However, from our experience we suggest installing them in dark areas such as the staircase or hallway. Clients do also opt to install them in bathrooms to give the room a more spacious look and match other silver and chrome details such as the taps and shower. Additionally, Great Rads offers you spectacular designs for these radiators such that they do not appear like radiators at all. Instead, they act as a striking piece of artwork for your home. The biggest advantage of these radiators is that they are available in almost all the colours imaginable. Stainless steel and mid steel are some of the raw materials that clients often prefer at Great Rads. 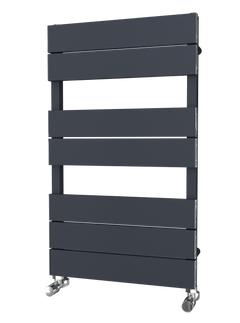 The Camino horizontal radiator, Chaucer horizontal radiator, Beaufort horizontal radiator and Columba horizontal radiator are some of the most favoured horizontal styles. Just like mirrored designer radiators, this radiator also provides a splendid look for your home. Many times, outsiders fail to recognise it as a radiator and mistake it to be a piece of art on display. They require limited wall space and do not consume the entire area, thereby leaving ample space to walk around and put furniture. In our experience we have found that these radiators are more apt for kitchens as the design fits well with most kitchen designs. Great Rads offers versatile shades like red on white, clear on black, gold globes, classic white, textured Matt white, etc. The matt finished radiators are one of the most popular as they are highly fashionable and current. There are multiple brackets of price range beginning from under £100 and reaching above £3000. There are also a number of brands from which you can choose. This radiator has has gained considerable popularity amongst customers over the last few years. Aluminium is considered to be the sturdiest material of all the materials available for radiators. The highly conducive thermal energy plays a major role in the extensive exposure aluminium designer radiator acquires today. With this, you obtain striking features such as quick warmth across the room, reduced energy bills, and they cool down easily. Aluminium radiators are easy to install and assure constant heat distribution all over the room. 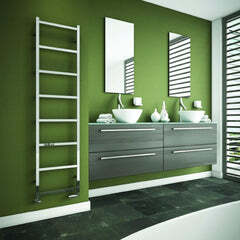 Mirror aluminium radiators have a spectacular design and therefore offer a stunning look to your home. Great Rads offer a large BTU range 500-999 to 11000-11499. We have great variety in terms of size such as 401-500mm to 1901-2000mm height and 0-300mm to 801-1200mm width. There are several brands which offer aluminium electric radiators. Since Great Rads have such a diverse range, we have options to suit any budget. You might think style will set you back, but may be surprised by the options available. Our radiators are designed to suit any budget and run efficiently, so they cost less on an ongoing basis. No matter your price range, ultimately, it all comes down to your style and design requirements and more importantly your budget constraints. Great Rads has years of experience in the radiator market, which we consider to be our main USP. 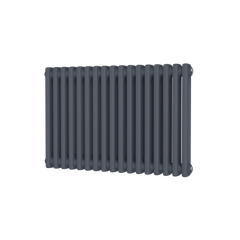 We also offer a diverse variety of radiators which are adequate to fulfil the unique requirements of our splendid clients. We have a brilliant series of hand-picked radiators to suit any style, room and budget. Along with these, we have numerous options in terms of raw materials. We offer high quality valves and other accessories that are required for your radiators. We have quality brands and suppliers under our wings to give you a vast number of selections to choose from. With our professionalism and expertise we have secured a reputed position in the industry, we are counted amongst the fastest growing radiator distributers across the United Kingdom. Here at Great Rads, we are not only a radiator provider, but are also proud to provide excellent customer service to all of our highly valued clients. We strive to provide our clients with the service that we would prefer ourselves, if the roles were reversed. We offer free delivery to all clients irrespective of where they reside in the UK. If you want to know more, do not hesitate and get in touch with us You can drop an e-mail on: enquiries@greatrads.co.uk. You can call us on: 01803 450330.